Zoogeographical region is a branch of biogeography that comprises distribution of animal species on some particular basis. Today we will explore some basic things on What is Zoogeographical region and declination of zoogeographical region, as its very essential to know the main reason behind the existence of animals of different species in different regions. The extant of variety of animals of varying species on this planet earth is based on certain causes. Their movement on different regions of the earth on some specific basis has resulted to the concept of What is Zoogeographical region. This concept further includes also the declination of zoogeographical region. This was made possible by some of the particular geographers which we will come to know about in this blog of What is Zoogeographical region and declination of zoogeographical region. So let's find some specific information about it below. (i) Zoogeographical region is basically an area that have a particular assemblage of animals which are unique to that particular area. (ii) The animals are more intelligent and mobile to adopt and adjust themselves within its environment in any particular region. But plants aren't so much capable of it. (iii) The animals are very much dependent in their ecological environment, at a rate lesser than that of plants. (iv) Animals mainly group themselves in the environment, according to the type of vegetation and their respective food supply. The herbivores have long and better digestive system, chewing teeth and long tongues. (v) The life of animals of different vegetative regions are distinctive, and such regions may be called as 'faunal region'. (vi) Till now, none of the climatic region may be termed as faunal region, despite of being some animals related and connected to different zonal climates. (vii) Moreover, there is the limit if landmass and micro-climatic regions, which may be known as continental limitation. (viii) The zoogeographical regions are further distributed on various basis, which is mainly due to the movement of animals which create some sort of barriers. Such barriers may be on the basis of water bodies, mountains, rivers or change in climate and much more. (i) P.L Sclater attempted to regionalise the zoogeographical region for the first time in the year 1857. (ii) This regionalization or division was made mainly on the basis of variety of bird species. Later, he managed to recognise almost six avifaunal regions. (iii) In the year 1876, A.R Wallace and Charles Darwin, made an advancement of the theory of 'Natural Selection' which is related to the zoogeographical regions on a close basis. (iv) Each region got separated from it's neighbouring region by a barrier, although not being equivalent to the continental landmasses. 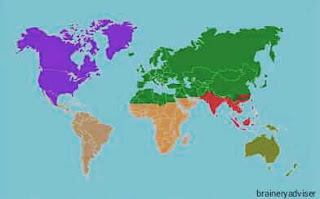 (v) The six divisions of zoogeographical regions are Palearctic region, Nearctic region, Neotropical region, Ethiopian region, Oriental region and Australian region. So, in today's blog we acquired some basic and specific information about What is Zoogeographical region and declination of zoogeographical region. This declination has resulted in the formation of various zoogeographical regions, which we will discuss on our next blog.